Artery Disease in Just 3 Minutes! The Diabetic TM-ABI is the first valuable automated ankle-brachial index measuring device based on oscillometric and pneumo-plethysmography method (Pulse Volume Records). The blood pressure on the upper and lower extremities is measured simultaneously, resulting in the calculation of the anklebrachial index (ABI). The result of the assessment is clear and straight forward, only what is really important – the left ABI and right ABI – are displayed. The measurement is repeatable and can be performed in only three minutes. The Diabetic TM-ABI measures ankle/brachial indices at distal posterior tibial and anterior tibial/dorsalis pedis arteries. 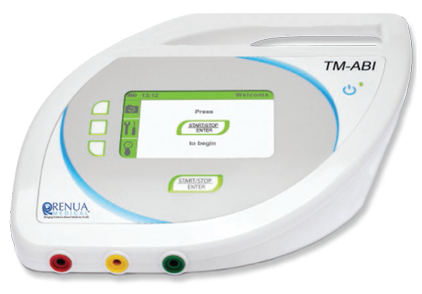 The Diabetic TM-ABI system is indicated for use on adult subjects at risk of having or developing peripheral arterial disease (PAD). The system is intended for the rapid measurement of ankle-brachial pressure index (ABPI), or ankle-brachial index (ABI), and pulse volume recording (PVR) / volume plethysmography. The Diabetic TM-ABI system is intended to be used to spot-check patients and provides information regarding patient risk. 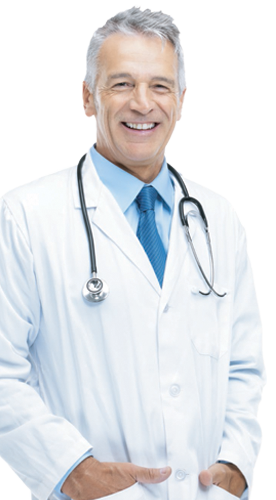 The physician, based on this information, is responsible for all diagnosis. 93922 – Limited, bilateral, noninvasive, physiologic studies of upper or lower extremity arteries analysis at 1-2 levels. 93923 – Complete bilateral noninvasive physiologic studies of upper or lower extremity arteries, 3 or more levels. Color-coded cuffs simplify the use of the device. The different colors indicate where to place each cuff. The red cuff is positioned on the upper arm, the green cuff on the right ankle and the yellow cuff on the left ankle. Each cuff is clearly labelled and includes a diagram to ensure correct placement, so no training is needed as comprehensive guidelines are provided. During the measurement, patient needs to be in the supine position. Consequently, the Diabetic TM-ABI is placed right next to the examination bed, so portability of the device is enhanced with a long lasting battery (50 measurements), which enables the device to be used wherever it is needed. When comparing ABI measurements obtained by oscillometric method vs. Doppler probe method, it was evident that oscillometric measurements were more precise; 17% vs. 19% respectively. Bland Altman plot showed bias of +0.06 and scatter diagram showed good correlation (slope: 0.75). In oscillometric method analysis percentage error was 0.26. Furthermore, assessment of the concordance index revealed a very good agreement between both methods in terms of clinical relevance: concordance index of 0.88 (95% CI: from 0.76 to 0.97). Oscillometric measurements were completed three times faster than Doppler probe measurements.